Guwahati: The grass on Nehru Stadium in Guwahati wept silently on Monday as their mentor bade his final goodbye, putting an end to his three-decade-long affair with them. Even the soil and workers at the pitch will miss him. 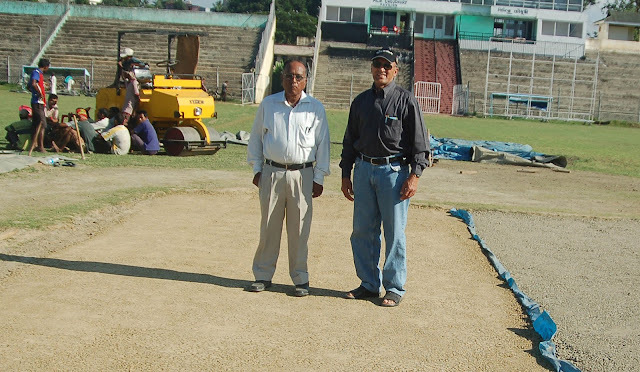 A glorious chapter in the field of sports in Assam came to an end on Sunday when one of the senior-most and renowned pitch curators of the country, Sunil Kumar Baruah, left for his heavenly abode at the age of 70. Their relations had started three decades ago when Team India faced the mighty West Indies at Nehru Stadium on December 17, 1983. “Sir was very close to us. Working with him was a nice experience. He never forgot to wish us on every occasion in our lives. We learnt a lot by working under him,” Bhabesh, a member of the ground staff at Nehru Stadium, remembered his superior on Monday after paying his tributes with tearful eyes. “Last night, he suddenly had problems after having dinner, and he left us before we could do anything,” said a close aide of Baruah. He left behind his wife Dipali Baruah, a son and a couple of grandchildren. From childhood he was attracted towards the game of cricket and used to follow it passionately till his last breath. “The game taught me the lessons of life, and I will always be in debt to cricket for what I’m today. It taught me to be disciplined in life and to face the challenges with a cool mind,” Baruah had told this correspondent in a chat a few months back. He used to cut the uneven fields to play cricket during his childhood days at Shillong, and those activities drew him towards the job. During his college days, he went all the way to Kolkata, Kanpur and several other venues to watch test matches, and used to talk to the people involved with pitch and ground preparations. “Once Krishti Bikash Sangha of Guwahati organised a friendly cricket match between film stars and cricketers featuring several big names, including Kapil Dev and Sunil Gavaskar, and I was involved in preparing the pitch of that match. That was the first cricket pitch I prepared in my career with the help of veteran Badal Thakur,” he had said. 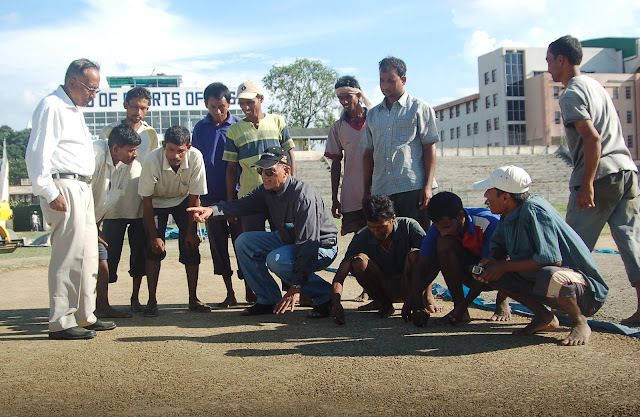 Then he got the opportunity to prepare pitch for the India-West Indies match. After that no-looking back as he prepared the wicket for all the 16 matches played at Nehru Stadium in Guwahati. Besides, he also prepared the wicket for Ranji and Duleep Trophy matches. He was also invited for several national seminars at various places in the country. Born in Shillong in 1942, Baruah was awarded with PhD by Gauhati University for his research on “Certain problems of Fertility among Khasi Women of Meghalaya”. Besides cricket, he also worked in several fields of academics and retired as assistant director, Directorate of Census. He also wrote several books on sports. He was also associated with Dibrugarh University, and was the academic director at the Assam Institute of Mass Communication and Media Research at Guwahati. Meanwhile, cricketing fraternity of the state, both past and present, have expressed grief and shock at the demise of Baruah. “It is a big loss for Assam cricket. We have lost one of the best curators of the country. It will be a tasking time for the state to fill the void as there is hardly anyone of his caliber. He was very dedicated and his passion for the game pegged him to carry on with his job till such an advanced age. Whenever we sought for a pitch to suit our game plan, I don’t remember him saying no at any stage. His experience in pitch curating will be always missed,” said former Ranji player Gautam Dutta. Senior curator Badal Thakur recalled his association with Baruah saying that his passion for the game drove him towards pitch curating. “There was time when I used to prepare the wicket in the Nehru Stadium and that was when I took him along with me. He adapted very nicely to the new techniques of pitch preparation. I don’t think anyone in the state stands to his stature to prepare pitches for the international standard today. I don’t know to what extent he played as a cricketer but certainly his passion for the game could be seen in his work. He will be missed in a big way by Assam cricket,” recalled Thakur. Another ex-ranji player Javed Zaman attributed the development of cricket to the highly-rated curator. “I was in a state of shock when I heard about it this morning. Just two days back I had a long conversation with him at the stadium regarding the wicket at the Barsapara stadium,” stated Zaman. Ratul Das, present curator in the BCCI’s zonal curators’ panel lamented on the demise of his colleague. “We worked together for a long time and shared a very good relationship. He will be missed by the cricketing fraternity.” Das remarked.